Immunologic impact of combined belatacept+αCD122 therapy in NHP kidney transplant recipients. 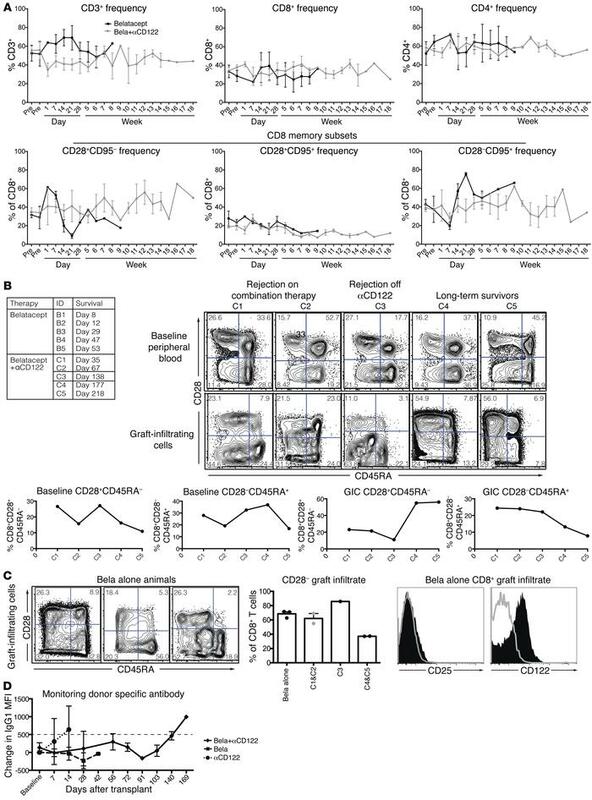 (A) Longitudinal analysis of CD3+ T cell frequencies did not reveal significant differences in CD4+ or CD8+ subsets, nor were there significant changes in memory subsets between belatacept (black squares) and belatacept+αCD122 (gray circles) treated animals. (B) Comparison of pretransplant CD8+ memory subsets did not discriminate between animals which rejected on combination therapy (C1 and C2) versus those which rejected after withdrawal of anti-CD122 (C3) versus animals with prolonged survival (C4 and C5). However, graft infiltrating CD8+ T cells in animals which experienced prolonged survival demonstrated a marked increase in CD28+CD45RA– T cells. Data represented by FACS plots and corresponding graphs depicting memory subset frequencies. (C) Characterization of graft infiltrate from 3 animals treated with belatacept alone demonstrating similar graft infiltrate phenotype to C1 and C2, combination therapy–resistant animals. Sample FACS plot of one belatacept alone animal demonstrating no increased expression of CD25 in graft infiltrating CD8+ T cells (solid black histogram) compared with peripheral blood (gray histogram, no fill) at the time of rejection. In contrast graft infiltrating CD8+ T cells (solid black histogram) had increased expression of CD122. (D) Combination belatacept+αCD122 (black diamonds) and belatacept monotherapy (black squares) treated animals did not develop donor-specific antibody during treatment. Animals receiving αCD122 monotherapy (black circles) demonstrated a positive DSA at the time of sacrifice. DSA greater than 500 MFI was positive.